Earlier this week, a friend and I were discussing the general state of the nation, the economy, and the upcoming election. We both had a heavy spirit over the uncertainty of our times. It still amazes me when God confirms in our hearts that our feelings are valid and shows us what to do. This conversation was no exception. We met deliberately to try to sort out some of these feelings. God showed up and guided us to some wisdom that almost immediately lifted our spirits. There are some very atypical things about this battle. Ordinarily, you’d put your best soldiers in the front, but Jehoshaphat appointed the Praise Team in the front to go out singing, for he knew the battle had already been won. They fought not with the armor and swords of men but with the artillery of the Lord. And God delivered unto them that day a victory that would have been an impossible feat for man. For our situation, we agreed that He is calling us to draw nearer, to pray harder, and to fast in some way. In so doing, we find our peace, our victory in Him. 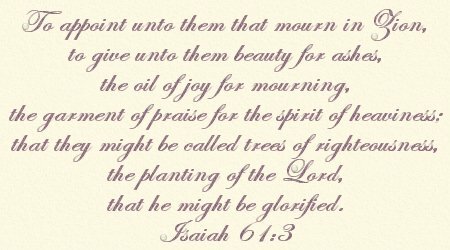 And lastly, and perhaps most importantly for that feeling of depression to lift, Isaiah 61:3 reminds us to put on a garment of praise instead of a spirit of despair, like a coat, like a shirt. We are to sing or turn on the music and praise Him right now. We do not live in defeat as Christians. It is impossible. Start praising Him today even before the victory. The victory is ours, no matter what. He died for it. It’s already signed sealed and delivered to His Hands. This entry was posted in Uncategorized and tagged armchair musings by annette g. Bookmark the permalink. Praise instead of despair – I have to remember that! Beautiful. I wish I had had help like this 12 years ago. It’s scary these days… especially here in Michigan. I wish I had fasted during this time before election day! Thank you for this wonderful reminder from King Jehoshaphat. I’m Praising Him with you, dear sister! The Lord gave me those same verses back in the winter when we were facing a decision about my husband’s office. They really spoke to my heart. These are good to pray for the election too. Thanks for sharing…they are great verses to claim and to pray. What a very nice post, very encouraging. this totally blessed me this morning. Thank you. Hopefully I will make the Wednesday lesson this week.